This article is a little different from others which appear on our site. We typically concentrate on traditional motorcycle GPS devices like a Garmin Zumo or TomTom Rider. Today, we’re concentrating on how to use a smartphone as a motorcycle GPS. We’re talking about larger phones like an Apple iPhone 6s Plus or Samsung Galaxy S7. Given the larger screens of these phones and some terrific GPS apps, these can make very capable navigation devices. There are a few things to think about when considering this move. Let’s take a look at what’s important when deciding to use a smartphone as a motorcycle GPS. There are a large number of GPS apps on the market. Some are absolutely free. My all time favorite GPS application is Waze. Waze is a GPS application available on IOS and Android. What sets Waze apart from the hundreds of other GPS apps is the integration of maps, technology and community based feedback to provide a driving experience that will save you time and tickets. Take a look at the screen shot that accompanies this post. It highlights a part of the Route 80 corridor in Northwest New Jersey. The little policeman head indicates there is a police presence. 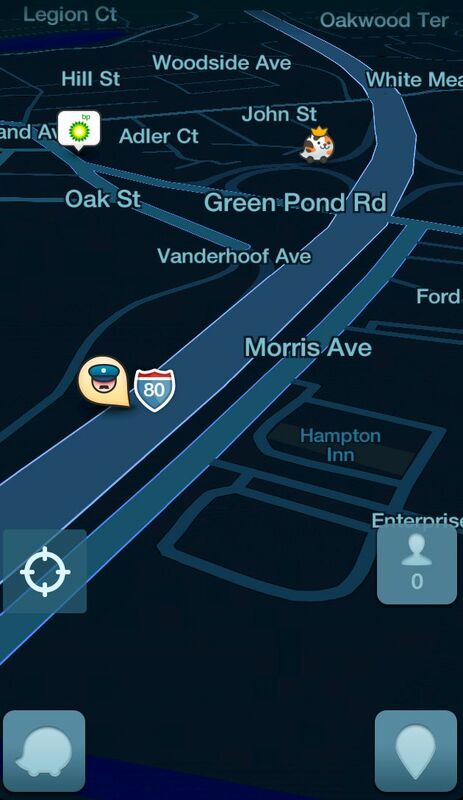 Waze received this information from an alert driver (or hopefully passenger) that saw the issue and notified Waze. The cat with the crown is a fellow Wazer a mile away. This is tracked by Waze’s computers using your GPS coordinates passed on to Waze by your smartphone. If you need gas, there’s a BP nearby as seen in the upper left. This is a screen shot taken on a Saturday night so you don’t see a lot of activity on the screen. If it was during the day on a weekday, you would see far more activity as Route 80 is a parking lot during rush hour. You will also see some rather interesting activity as the app permits Map Chat where drivers who don’t know each other can strike up chats. Sure there are a lot of other apps like Google Maps and several that are marketed specifically for motorcycles. In my opinion, don’t bother. Waze is the best. Just like a GPS, you need to think about where to mount your smartphone. Most can use the handlebar, but just a GPS, you can select other locations like the clutch or fairing. The key to successfully mounting a smartphone to a motorcycle is that it needs to be a good mount that will hold up to the vibrations on a motorcycle. A good mount is going to ideally have a universal cradle that closes tightly around the smartphone. I also suggest using a safety tether for added security. Your mount should also be capable of swiveling into landscape mode for the best GPS experience. A good mount is critical if using a smartphone as motorcycle GPS. I wasn’t sure what else to call this section. I’m talking about a good case. Like those from Otterbox or LifeProof. Get a good case for your smartphone to protect it from road debris. But a good case. It can save hundreds in repair bills for a damaged display. This refers to how easy is it to use on a motorcycle. This is where a motorcycle GPS might be better than a smartphone. Most motorcycle GPS devices are glove friendly meaning if you’re wearing gloves, you can still interact with the GPS. A smartphone can’t be used with gloves. Now with that said, don’t interact with any GPS or smartphone when riding. Get it setup before you ride and pull over if it needs to be adjusted. Another advantage of a motorcycle GPS over a smartphone is weather resistance. Most motorcycle GPS devices are weatherproof meaning you can drive in moderate rain. Don’t even try it with an exposed smartphone unless using a weatherproof case with it. A smartphone instead of a motorcycle GPS can be a good idea, especially given the fact that most people already own one. Using a free app like Waze, it’s simply an added cost of a good mount. Always be sure to apply good safety practices and not interact with a device while riding.